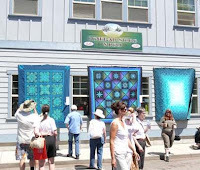 This Saturday I had the joy of going to the Sisters Outdoor Quilt Show in Sisters, Oregon. It's the largest outdoor quilt show in the world featuring well over a thousand quilts. This little town of less than 2,000 residents draws several thousand visitors to it's quilt show. The show covers 4 long blocks by 8 blocks which is pretty much the whole town. 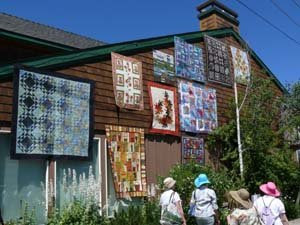 The Sisters Outdoor Quilt Show started in 1975 with just 12 quilts. Jean Wells, owner of the local quilt shop the Stitchin' Post, intended the show to be open to anyone who has made a quilt that they are proud of. Even today the quilts are not judged or juried. So you see everything from ordinary quilter’s best work to exceptional work by artists and teachers. Quilt entries come from all over America and from several other countries. But the real fun of the show is the festive feel of it all. It’s a celebration of quilts and quilters. What a delight it is to be admiring quilts hanging from buildings and anything else that can display a quilt. 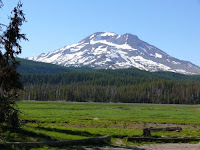 The setting near the Three Sister’s mountains is stunning and you can’t believe the weather. In 33 years the show has never been rained out.